* All fares below were last found on : Apr 18, 2019 11:47:47 PM. Fares are round trip. Fares incl. all fuel surcharges, our service fees and taxes. Displayed fares are based on historical data, are subject to change and cannot be guaranteed at the time of booking. 63% of Bradley Airport travelers were over the age of 35. 26% of Bradley Airport travelers were over the age of 60. 7% travelers traveled to BDL with kids under the age of 14. 27% of BDL travelers were millennials. 55% of BDL travelers were female. SJU, MCO, FLL were the most popular destinations visited by First-Class travelers from BDL. Travelers spent an average of 5.00 days in Bradley Airport. 6:00AM - 7:00AM are the busiest hours at BDL. Every week, at least 1161 domestic flights and 211 international flights depart from BDL. 1319 flights arrive each week at BDL. 1318 nonstop flights arrive at BDL each week. The first flight to BDL departs around 6:00AM - 7:00AM. The last flight to BDL departs around 9:00PM - 10:00PM. March was the month with most bookings for BDL airport. December was the month with least bookings for BDL airport. With daily 350 operations, Bradley International Airport is the Connecticut's busiest commercial airport. The prominent airlines flying to and from this airport include Air Canada Express, Air Canada Express, AirTran Airways operated by Southwest Airlines, American Airlines, American Eagle, American Eagle operated by Republic Airlines, Apple Vacations operated by Frontier Airlines, Delta Air Lines and more. It is a public and military used airport that is located in the Windsor Locks in Hartford County, Connecticut, United States. Serving the Hartford, Connecticut & Springfield, Massachusetts, Bradley International Airport is well equipped with advanced facilities and amenities. For 2011–2015, this airport is included in the National Plan of Integrated Airport Systems for that categorizes it as a primary commercial service airport (more than 10,000 enplanements per year). It covers major destinations including the Toronto, Montreal, Atlanta, Chicago, Detroit, Orlando, Las Vegas, Newark, Washington, Philadelphia, Cleveland, Fort Worth, Dallas and others. Book flights to Bradley Airport (BDL) with CheapOair! In addition to offering competitive airfares to locations most convenient for you, we provide useful information to inform your travel to BDL. Read below to learn more about BDL flights, and count on CheapOair for the best deals on all of your travel booking needs. At Bradley International Airport you will get a plethora of options to fulfill your commuting needs. For best car rental services you should opt for Alamo, Avis, Budget, Enterprise, Hertz, National, Thrifty and others. New Country Motor Cars, Inc, King limo Service, ICS Limo Connecticut, ABC Taxi, Limousine service and Tours are the major taxi and limousine service provider at airport. Appreciated all over for its efficient facilities and amenities, Bradley International Airport is one of the best in the business. Enjoy magnificent dining experience at Black Bear Restaurant, Boston Pizza, Cask & Barrel Bistro. Don't forget to try out donuts at Dunkin Donuts, it is located at Terminal A. For hot and cold coffee, Starbucks Coffee is the best bet. From buying gift for your loved one from gift shop to buying newspaper or magazine from newsstand, there is no shortage of amenities at this airport. With the free Wi-Fi facility, you can check mails or have video conferencing on Skype. 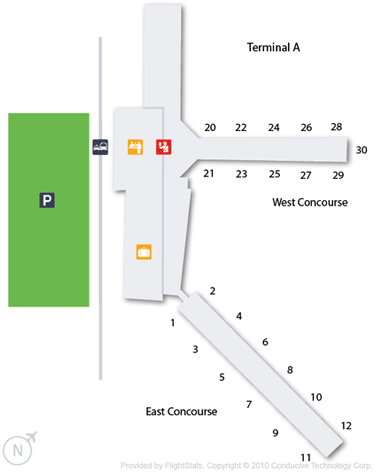 Bradley International Airport has 3,500 spaces for car parking. 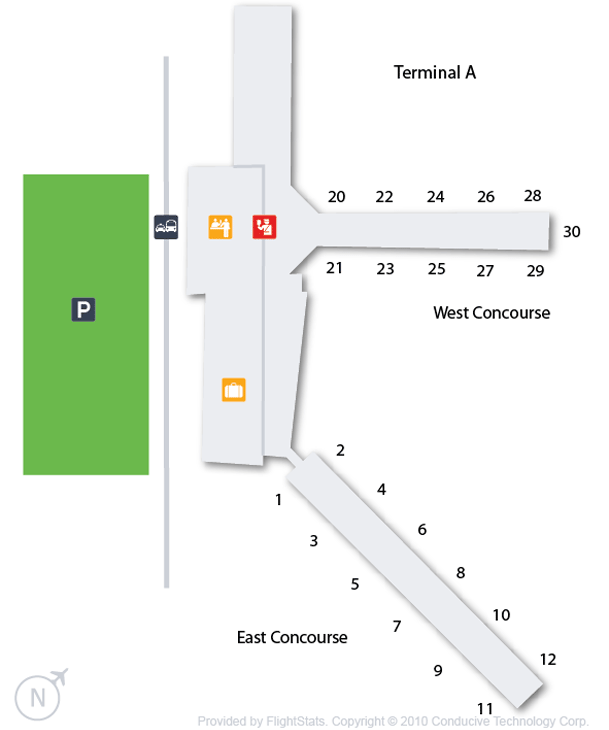 Short term and long term, both types of parking facility is available here. Find cheap hotels in Hartford - Lowest rates for all sorts of Hartford hotels!